That does not mean our trees are yet in crisis. 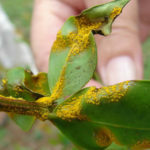 Of the 31,000 pōhutukawa and rātā inspected by MPI and DOC since May last year, only 234 (less than one percent) were found to have the disease. We can expect that number to increase, perhaps rapidly, but we’ll hopefully have time to put strategies in place to limit the damage. The three most important strategies are scientific research, seed collection and community vigilance. Science will hopefully identify strains of pōhutukawa and rāta that are resistant to the disease, seed collection will provide a source of future trees, and community vigilance will help to identify both where the disease is impacting and where it is not. Project Crimson will be part of that effort and our extensive network of partners and supporters will be vital to it. We’ll continue to support the planting of pohutukawa and rātā as part of our general programme, which includes our partnership with the Mazda Foundation for Treemendous Schools and our partnership with The Tindall Foundation and others in our ambitious Trees That Count programme. 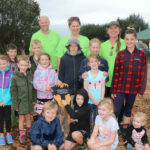 In fact, the same week that MPI made its announcement about myrtle rust, we joined the parents, staff and students of Clifton School in Bulls for their Treemendous native planting and launched the new Community Marketplace as part of our campaign to plant 200 million native trees for climate change mitigation by 2028.